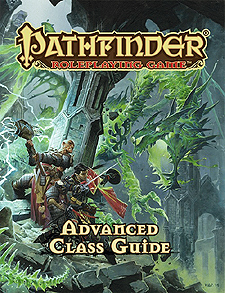 Adventure like never before with the Pathfinder RPG Advanced Class Guide! Explore new heights of heroism with 10 new base classes, each with more than a hundred new archetypes and class options. Prepare characters for their most legendary adventure ever with massive selections of never-before-seen spells, magic items, and more! The Pathfinder RPG Advanced Class Guide! is a must-have companion volume to the Pathfinder RPG Core Rulebook. This imaginative tabletop game builds upon more than 15 years of system development and an Open Playtest featuring more than 50,000 gamers to create a cutting-edge RPG experience that brings the all-time best-selling set of fantasy rules into the new millennium. Ten new base classes - the magic-twisting arcanist, the ferocious bloodrager, the cunning investigator, the daring swashbuckler, the formidable warpriest, and others. Hundreds of new spells and magic items, such as feasts on fear and skullcrusher gauntlets. An entire armoury of amazing equipment, from vital new adventuring gear to deadly alchemical weapons.